We give each child individual care and attention. Our coaches know where the children are in their development and are best equipped to further their development until the end of our programme. We provide children aged 5 to 12 with an excellent structured development programme progressing them step by step. Training for advanced players will take place once a week for 1 hour with the option of match-play a second day of the week allowing children the opportunity to put what they have learnt in coaching into practice. ½ Court tennis is the first step, catering for children aged 5-7. Red tennis balls are used at this stage. They are bigger, slower and lower bouncing tennis balls. This makes it easier for young children to learn how to play and results in them loving the sport from the start. 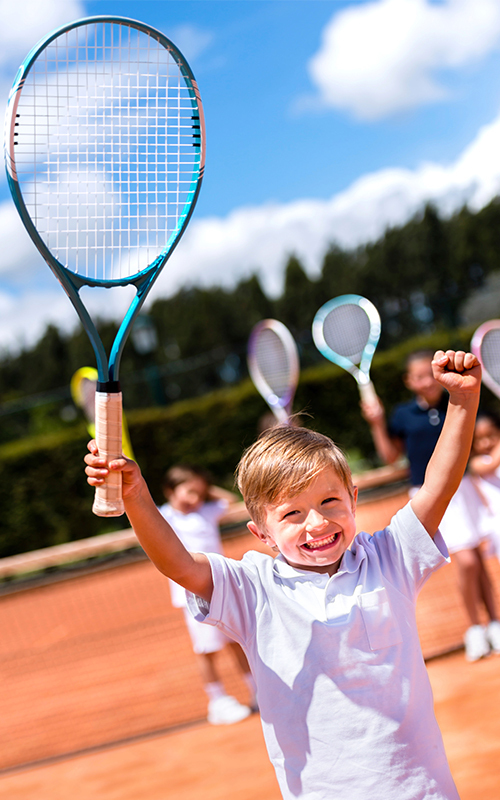 ¾ Court tennis is the second stage for children aged 8-9. On the ¾ court, young players can develop an all-court game style. Orange tennis balls are used, they are easier to control than regular tennis balls and bounce slightly higher than the red tennis balls which players will be more than ready for at this stage having completed stage 1. Children will receive a Tennis4kids Certificate on completion of this stage giving them the confidence and motivation to reach the next level. Full court tennis is the final stage in our structured development programme. This is usually for players aged 10-12. Green tennis balls are quicker than the orange ones but slower than regular tennis balls which makes the transition to full court tennis a lot easier. This gives players more confidence and leads to advanced players wanting to test their skills against other players in point situations.